Fraudsters stole thousands of pounds from pensioners in a bank card scam operated at supermarkets across Northern Ireland, a court heard on Wednesday. Eight victims, many aged in their seventies and eighties, were targeted as part of a racket which also extended to the rest of the UK and the Irish Republic, it was claimed. Details emerged as the alleged leader of an organised gang behind the crime spree was remanded into custody. Catalin Sandu, a 38-year-old Romanian national, is charged with a total of 31 counts of either theft or fraud by false representation. 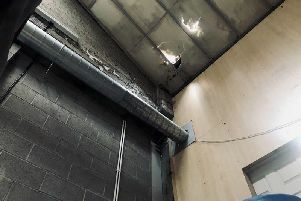 The alleged offences were committed at locations in Belfast, Craigavon, Bangor, Cookstown, Dungannon and Sprucefield between May 17 and June 23 last year. Appearing before Belfast Magistrates’ Court, Sandu, of Crowther Street in Wolverhampton, nodded to confirm he understood the charges against him. In this case the vast majority of victims are in their seventies and eighties. Opposing bail, Detective Constable Lyness claimed the defendant was in charge of a gang operating throughout Britain and Ireland. “It preys on the vulnerable, particularly the elderly,” he said. Up to five gang members were said to be involved in offences at retail premises where alleged victims are distracted after entering card details at checkouts. District Judge Peter King was told Sandu is also wanted for questioning by police in Scotland. “It’s a very lucrative crime spree,” Detective Lyness claimed. Defence solicitor Matt Higgins insisted his client must be presumed innocent. He argued that the case against Sandu, described as a car valeter on the charge sheet, was based on CCTV evidence. “There’s no admission or acceptance that he’s been here (in Northern Ireland) at all,” Mr Higgins added. The court also heard that eight victims feature among the “huge” number of charges. Detective Lyness contended, however, that the footage was clear. “There’s excellent CCTV evidence of the defendant targeting elderly victims in supermarkets around Northern Ireland - Asda, Sainsbury’s, Marks and Spencer,” he claimed. Refusing bail, Judge King cited the risks that Sandu may flee or re-offend if released. Sandu was remanded in custody to appear again by video link on July 29.